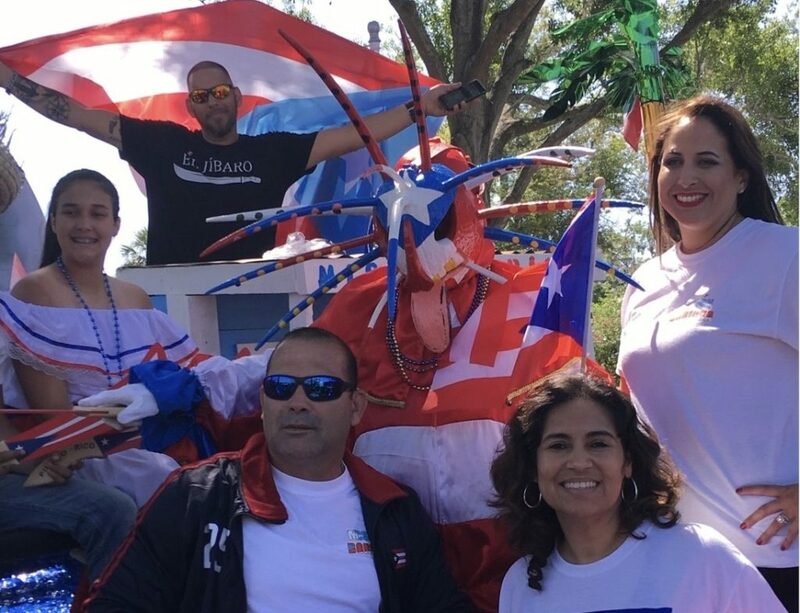 On a recent Saturday morning Yhoselyn Andrade stood with a clipboard in hand at the sidelines of the Florida Puerto Rican Parade and Festival in downtown Orlando. Andrade, who works with the civic engagement organization, Mi Familia Vota, was there for a very specific reason. 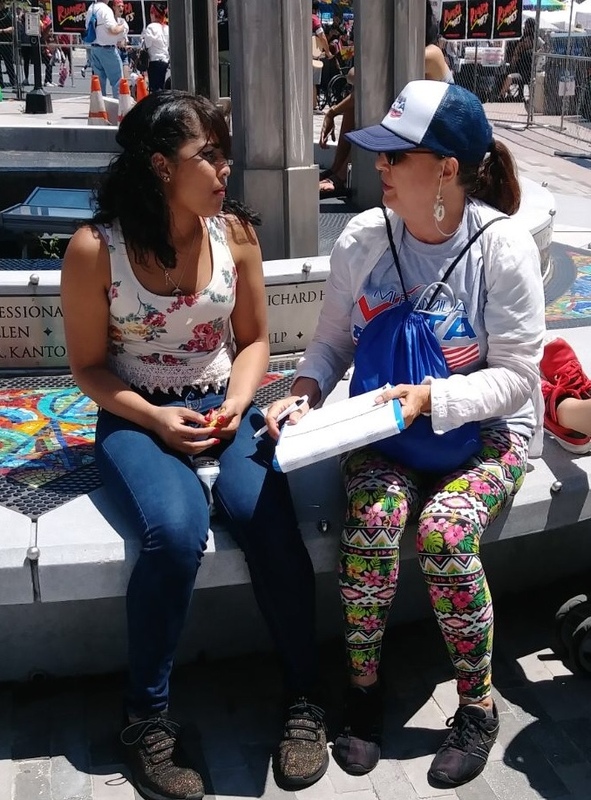 In addition to the group Andrade works with, representatives of the Democratic and Republican Parties, as well as elected officials – some of whom are Puerto Rican—were scattered around the festival talking to potential constituents and holding voter registration drives. The battle to get Puerto Ricans registered to vote is in full swing in Florida, where it’s estimated more than 56,000 people have moved from the island since Hurricane Maria made landfall there on Sept. 20, 2017. Political and civic organizations have been busy registering the newcomers. The influx of Puerto Rican evacuees could amplify central Florida’s role as the “swing part of the swing state,” in what are expected to be closely contested mid-term elections in November. 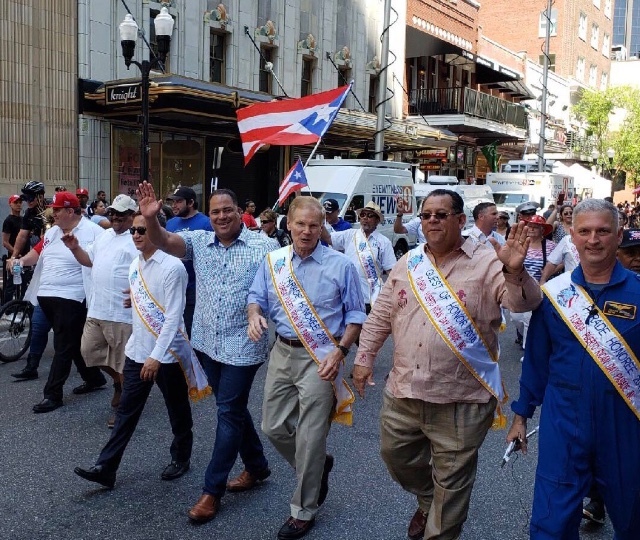 Event organizers tried to discourage political candidates from campaigning at the parade because Florida Puerto Rican Parade Inc. is a non-profit organization. But that didn’t seem to stop some of them. Florida Governor Rick Scott, a Republican challenging the Democratic incumbent U.S. 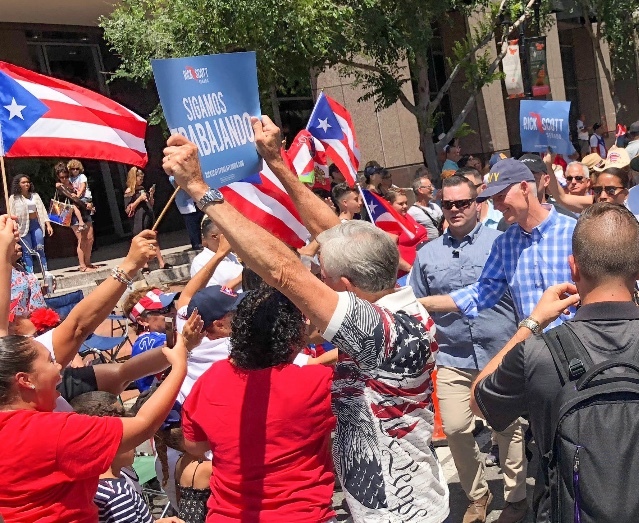 Senator Bill Nelson for his seat, walked between floats with a group of supporters holding campaign signs and chanting the campaign slogan “Seguimos Trabajando” (We Continue to Work). Nelson was there too, marching just behind Scott along with community leaders, war veterans and other dignitaries, but without any campaign signs. Both men have visited Puerto Rico several times since Hurricane Maria. Scott set up welcome centers at airports to help evacuees as they arrived while Nelson has pleaded with the federal government numerous times to provide more help to the island but also to the new arrivals in Florida. The Puerto Rican exodus to Florida has steadily accelerated over the past decade due to the island’s financial crisis that created economic hardship for residents of the Caribbean island and United States Territory. After Hurricane Maria hit Puerto Rico as a Category 4 storm, causing more than $100 billion in damages, and leaving residents without electricity and other basic services for months, the flow of people reached record levels. Six months after the storm, over 135,000 people have migrated from Puerto Rico to states such as Florida, New York, Massachusetts, Connecticut, New Jersey and Pennsylvania with the vast majority, 42 percent, coming to the Sunshine State, according to The Center for Puerto Rican Studies based at the City University of New York (CUNY). Puerto Ricans are the fastest growing group in Florida —one in five Latinos in the state is Puerto Rican— and political experts say the Puerto Rican vote could be a deciding factor in the upcoming 2018 midterm elections. Because Puerto Ricans are U.S. citizens they qualify to vote in states where they have relocated. President Donald Trump won Florida by 1 percentage point in 2016 in an election year when Hispanic voter turnout was lower than expected. Puerto Ricans coming from the island are not typically committed to any party, but more often than not they lean Democratic. Patricia Brigham, president of the League of Women Voters of Florida, said the challenge is to convey that voting should be on the list of priorities at a time when evacuees are facing more pressing issues like finding affordable housing, employment and education for their children. “Voting is going to determine the future of healthcare in our country and education, the future of jobs,” said Brigham, noting the organization is launching education programs in Spanish to help Puerto Ricans. The Puerto Rican influence in central Florida’s Orange and Osceola counties goes beyond the restaurants and businesses that dot the area. In 2016, the community’s voter turnout helped elect Florida’s first member of Congress of Puerto Rican descent, Democrat Darren Soto. Voters also elected Amy Mercado to the Florida House, her father, Víctor M. Torres, Jr. to the Florida Senate, and Emily Bonilla to the Orange County Board of County Commissioners, where she became the first Puerto Rican Democrat to hold that office. Last year, a group of Puerto Ricans working with the civic organization Vamos4PR, successfully lobbied to have the Orlando School District adopt new policies to help the influx of Puerto Ricans that were already leaving the island before the hurricane. The three policies approved by the school district included, translating the district’s website into Spanish, a Spanish hotline number where parents can call and ask questions, and a monthly orientation in Spanish for families. The next big challenge is getting the newcomers to register and vote in November. “I think this might be an opportunity for Puerto Rican organizations to demonstrate (that) once you mobilize a segment of the electorate, they turn out to vote in a meaningful way,” said Carlos Vargas-Ramos, a researcher at the Center for Puerto Rican Studies at CUNY. In central Florida, a grassroots effort among numerous nonpartisan organizations including the Hispanic Federation, the League of Women Voters of Florida, Mi Familia Vota, Misión Boricua, and UnidosUS, to mention a few, are conveying an important message to Puerto Rican newcomers: Your vote matters. Esteban Garcés, Mi Familia Vota’s national operations director based in Orlando, said his organization targets low engagement voters — those who might vote in presidential elections but not typically midterm, local or special elections. Mi Familia Vota concentrates its voter registration activities in high-traffic areas Latinos frequent such as supermarkets, bakeries, restaurants, churches, libraries, schools and events. The group, like many others in central Florida, is embedded in the neighborhoods in which it works and knows the community well. The various groups coordinate and divide areas geographically to prevent duplication of efforts. In 2015, as Mi Familia Vota staff analyzed data from voter registration rolls, they discovered that 49 percent of new registrants were either Puerto Rican or of Puerto Rican descent. Voter registration data from the supervisors of elections in central Florida counties shows that a total of 27,442 people who identified themselves as Hispanic, although not necessarily Puerto Rican, registered to vote in Orange (19,892), Osceola (6,010) and Seminole (1,540) counties between September 2017 and as recently as April 2018. The LIBRE Initiative, an organization funded by the conservative Koch brothers, takes a different approach. 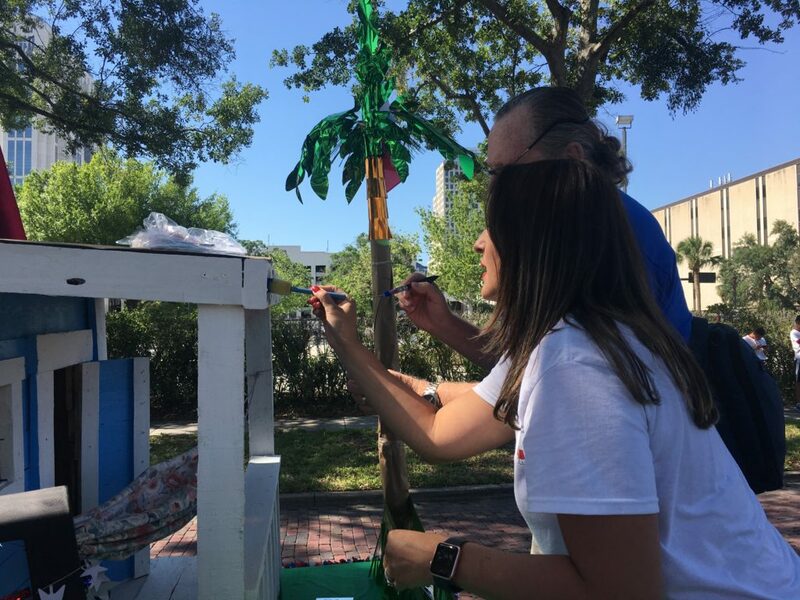 Rather than directly registering voters, it conducts a series of workshops called “Welcome to Florida,” aimed at helping Puerto Rican newcomers. These include English classes, building resumes and connecting people with local businesses. The workshops, launched in January after the initial influx of hurricane Maria evacuees, stress conservative issues such as lower taxes and regulation and free market economics. “We do have those conversations but they are never about parties and are never about registering people to vote,” said Wadi Gaitán, a LIBRE initiative spokesperson. In Puerto Rico, Election Day is a holiday and turnout is high by U.S. standards. Every four years voters on the island choose a governor, a state legislature and local officials. Some newly-arrived Puerto Rican voters could be discouraged from voting in Florida, with the transition to more frequent elections, longer lists of candidates for federal, state, and local positions in addition to ballot initiatives, political observers say. Then again, they add, others may vote out of frustration, with memories still fresh in their minds of the federal government’s slow response to the hurricane. In several visits to central Florida this year, Puerto Rico Gov. Ricardo Rosselló has urged evacuees to turn their outrage and frustration into votes against politicians whose policies hurt the island including the tax cuts approved by the Republican majority in Congress. Adela López, president of Misión Boricua, a civic organization based in Orlando said Puerto Ricans have a responsibility that many fail to acknowledge. “That vote affects your local and state representatives, but you carry Puerto Rico on your shoulders when it comes to the federal,” López said, as she took a break from overseeing the finishing touches on the group’s float at the parade. The float depicted a humble wooden house known as a “casita,” inspired by “Boricua en la luna” (Puerto Rican on the moon) — a nostalgic poem by Juan Antonio Corretje which tells the story of a man whose impoverished parents moved from Puerto Rico to New York, and the sacrifices and challenges they endured to provide for their family. The growth in the Puerto Rican population along the I-4 corridor is also encouraging political candidates for local offices including school board, county commission and the state legislature. Johanna López, a teacher at Colonial High School in Orlando, is a first-time candidate running for the Orange County School Board. Lopez said she also seeks to address the lack of programs in the school district to help families dislocated by Hurricane Maria, especially evaluating and tracking student performance and development. State Senator Víctor M. Torres, Jr. represents the southern part of Orange County and Osceola County where about 200 Puerto Rican evacuees are currently living in hotels in Kissimmee. “As far as I’m concerned everything comes to voter turnout when the time comes and that people know who is standing for them,” Torres said. Torres said Puerto Rican voters have not forgotten what happened after the hurricane. The images of President Donald Trump throwing paper towels at the crowd and downplaying the catastrophic damage caused by the storm are still fresh. By the end of the day, Mi Familia Vota’s team of 12 canvassers had registered 125 people attending the Puerto Rican parade. The nonpartisan group says they’ve seen a jump in voter registration, which is unusual during midterm elections when it’s harder to engage Latinos. They know their efforts to register voters is just the beginning of the process. But those who have left the island because of the hurricane, or due to the financial crisis, care deeply about the Puerto Rico’s future, and this by itself could be enough to get them to the polls in November.